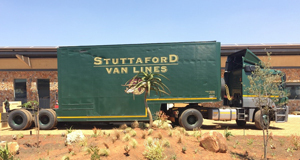 Stuttaford Van Lines successfully completed one of its most intensive moves to date: the relocation company moved an entire laboratory over 470 kilometres and more than five hours’ drive from Greytown, KwaZulu Natal to Delmas in Mpumalanga, in less than a day. Pannar Seeds South Africa (purchased by American company, Du Pont), contracted Stuttaford Van Lines Durban to move its R22-million laboratory consignment to its brand new, state-of-the-art headquarters in Delmas, Mpumalanga. Although experts in moving and relocation, the SVL team needed a little help in dismantling and re-assembling the highly specialised laboratory equipment. Du Pont assigned four engineers to assist the team to reassemble the pieces of equipment which weighed between 350kg and one ton, each. 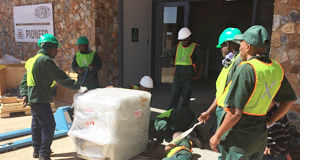 Every precaution was taken to ensure the safe handling and transportation of these valuable pieces of apparatus. 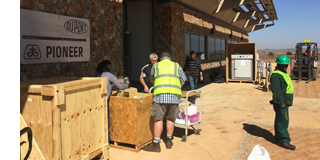 Due to weight constraints, forklifts were used at both loading and delivery points, however, manual labour also played an important role in the logistical process and contributed towards the overall success of the move. There were many facets to the operation; every piece of equipment had to be crated, lined with foam, loaded, transported, unloaded and reloaded onto the shuttle vehicle : A smaller, flatbed truck was used to drive between the laboratory and the loading area as rain storms prevented the Superlink to drive on the muddy terrain. Unloading started at seven on the day and the last item was unloaded thirteen hours later. “I am extremely proud of our team that handled this extraordinary load. They realised the importance of this project and got the job done,” Stuttaford Van Lines Durban Manager, Duncan Schulze, said.